Jonas Gustavsson likes us, he really, really likes us! Sportsnet is reporting that the long awaited decision by Jonas Gustavsson is over as he's decided to start his NHL career with the Toronto Maple Leafs. An announcement is expected as early as today as "The Monster" signed off on a 1-year, $900,000 to start the 09-10 season backing up Vesa Toskola. The Best Goaltender Outside the NHL™ will battle Vesa Toskala for the #1 job, even though MLSE will tell you he's backing up Tosky. Hopefully, he's worth the wait. Surprised it's only for 1 year. Is Martin Gerber still a Leaf? Great News after reading Horrible news (Martin Streak). Mike, stop this roller coaster of a ride that you call torontomike.com!!! Gerber's an UFA. The Leafs won't sign him now. 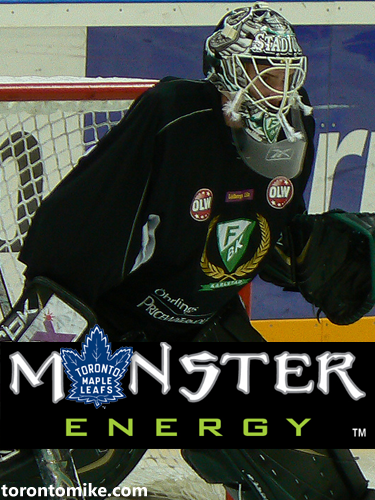 We're good, with Tosky and THE MONSTER vying for the top job and Pogge backed up by Reimer for the Marlies spot. We'll take him from you for Burke tampering with the twins. PS. I would love to tamper twins, but not the Sedins, maybe the William sisters. LEW: You cant be speaking of the tennis playing Williams sisters. If so, you need a new TV. You can take the Osgerby sisters. going to try and ignore the tennis comment. good they signed him for a year. it's a good deal. i think it's an okay signing. they aren't going to bother signing gerbs now are they...i mean they just ringed poggster too. oh well. i guess have lots of d men and goalies is never a bad thing. i think some of the moves are fine, even though i thought we had to scrap it bare to rebuild really. i don't think the team will be the team next year but hopefully they play decent night in and out and not in streaks like last year or their record from the beginning of the year as opposed to the later half. they should stay away from the heatley deal...and did burkie really try to tamper with the twins. i read marek's tweet about how he wants to be back at work so he can discuss this stuff...can't he do it anyways, even if it is his vacation.